In 2018 we purchased £600 worth of books and other material which was presented to teachers responsible for PSHE in junior schools in the Eastbourne area. 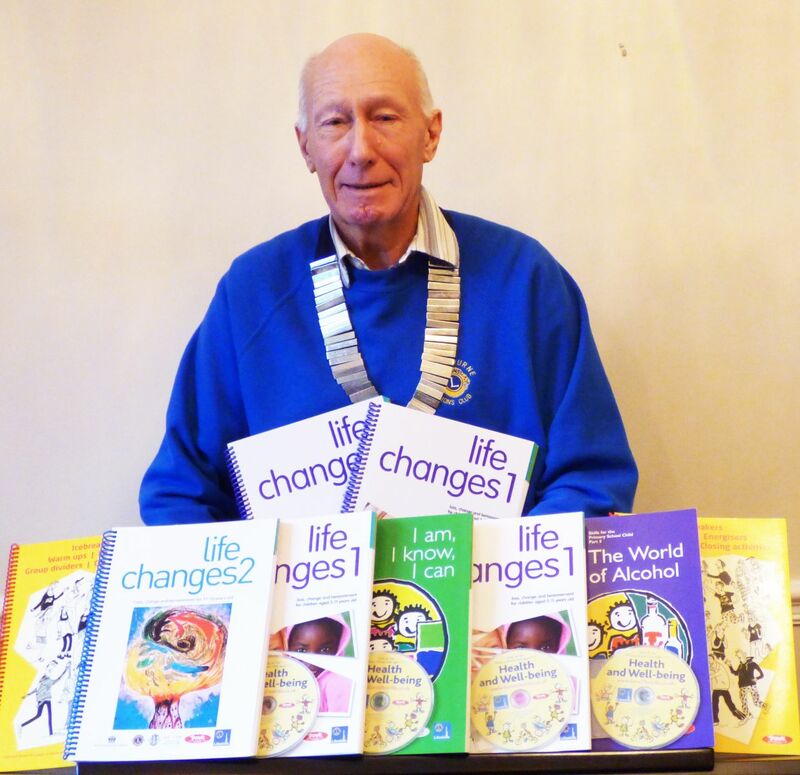 In 2017 we presented Lions Life Skills educational training guides "I Am I Know I Can" and "Life Changes" (loss, change and bereavement) to Willingdon Primary School. Mrs Denyse Weller, Leader of Learning for Curriculum at the school said "I would like to thank the Lions for donating the material, it will be used for the personal development of students throughout the school". Photograph shows President Graham Parish presenting the guides to Mrs Denyse Weller in the presence of Headteacher Mrs Kerry Twiselton. We recently sent a further batch of knitted teddy bears to Krugersdorp. 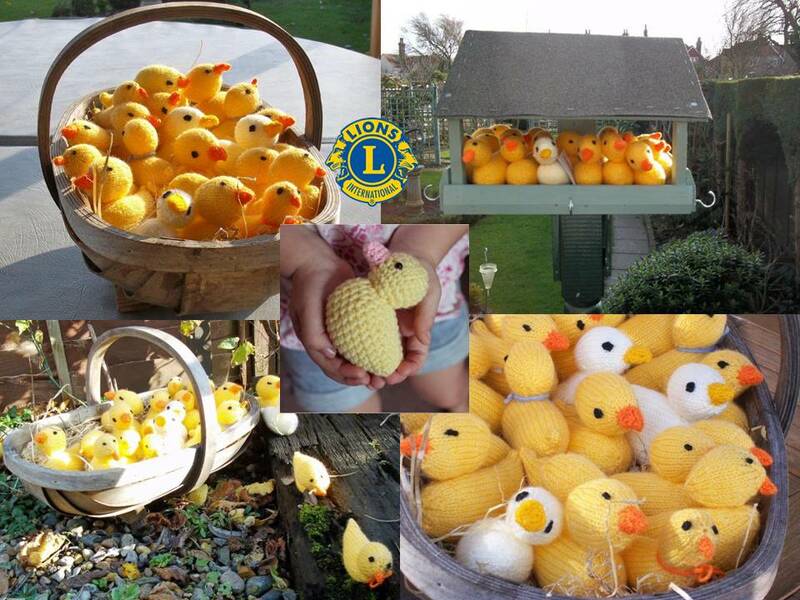 The bears are finished by the local lions club in South Africa for use by the Teddy Bear Clinic. The clinic provides therapy, counselling, assistance, love, comfort, safety and ongoing support to children who have been abused. Peggy Du Plooy of the Krugersdorp Lions Club said “we are most grateful for the teddies you send, the need is so great here and it is getting worse with the rising unemployment and political upheavals”. 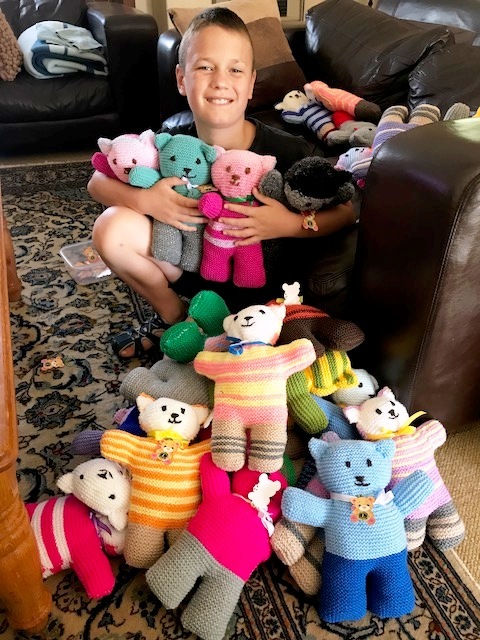 We have been sending teddies to South Africa for over ten years and would like to thank the local residents including those from Queen Alexandra Homes who knit the soft toys and Peskett Solutions and Tuffnells Parcels Express who sponsor the transportation. 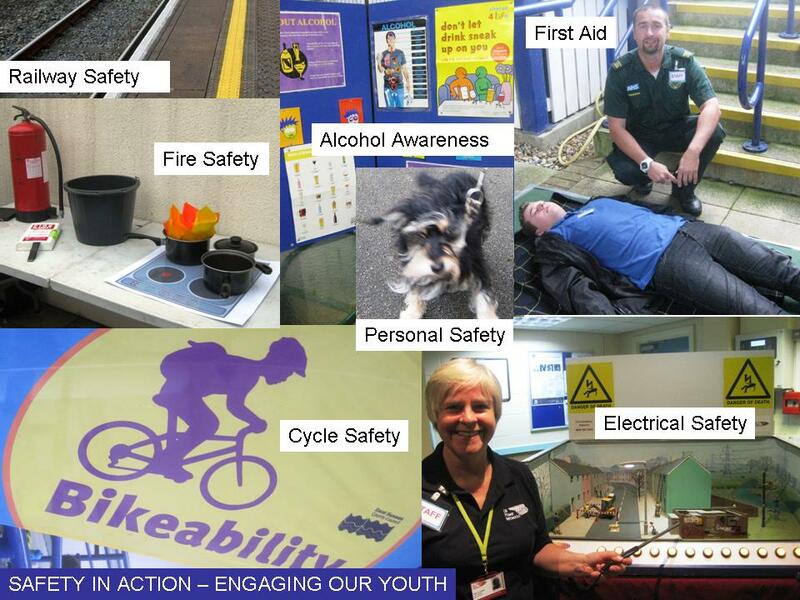 We annually sponsor a prize for this project - engaging with 15 schools and 850 pupils on a safety educational initiative. Supporting the Police, Fire and Ambulance services.to deliver a children’s interactive safety event to teach children through simulated scenarios about keeping safe in a variety of situations. The idea is to learn through doing - rather than just being talked to! 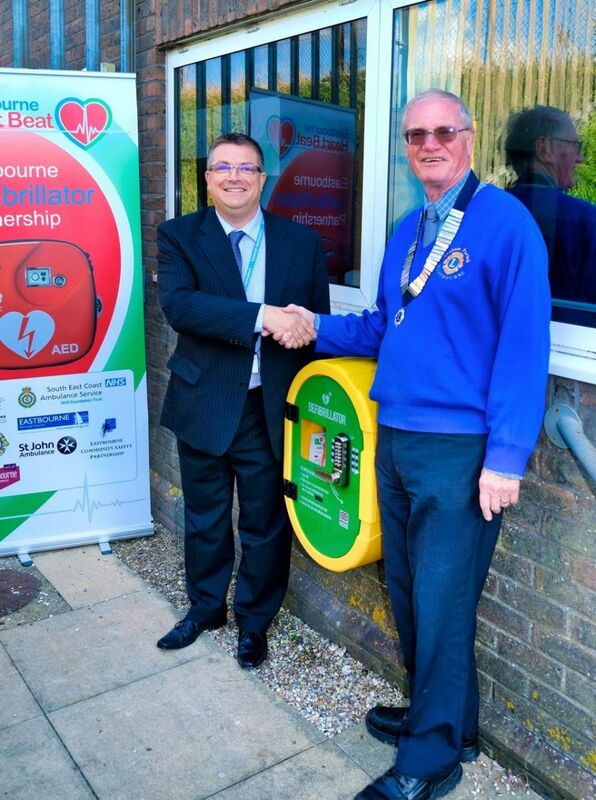 In August 2016, working in partnership with Eastbourne Borough Council, a defibrillator was installed at the Tourist Information Office in Cornfield Road. 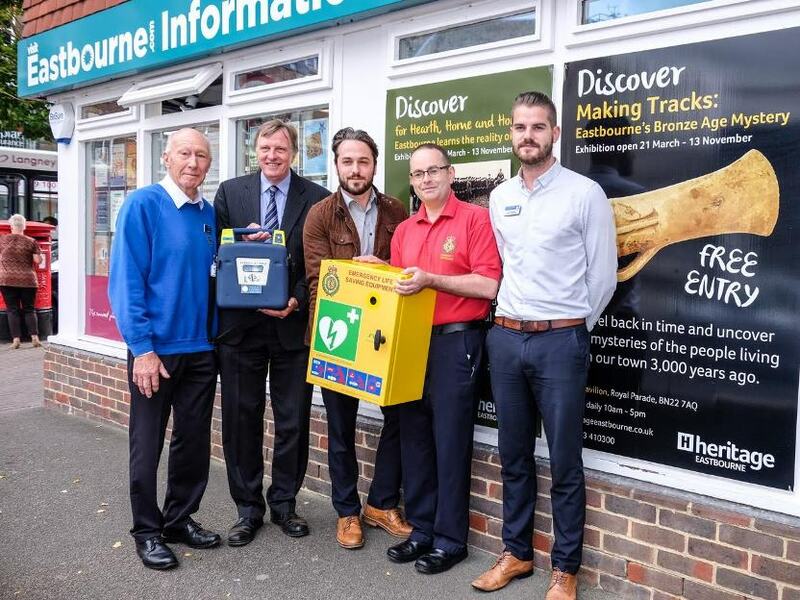 We worked with Eastbourne Borough Council and Eastbourne First Responders actively seeking sites to install new PADs to benefit the greatest number of people in the Eastbourne Area. 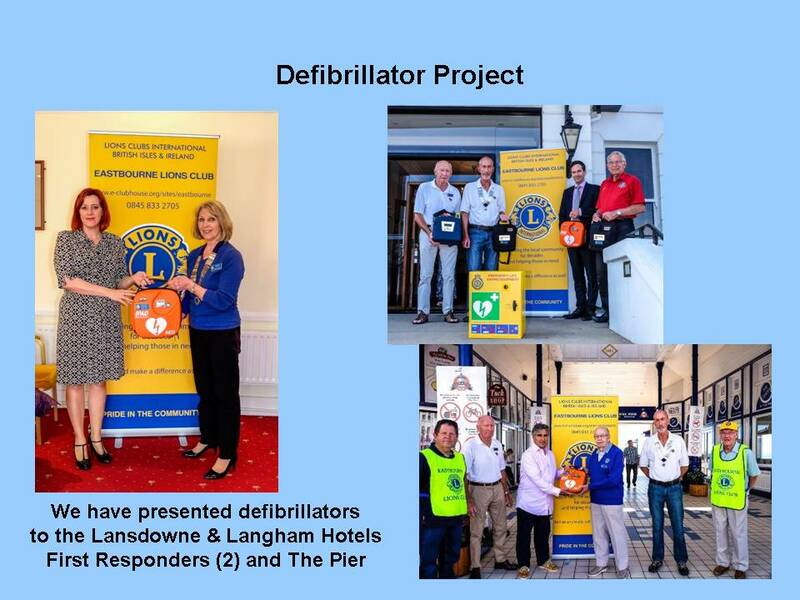 We have already contributed over £5,000 towards the defibrillators shown in the photographs above. 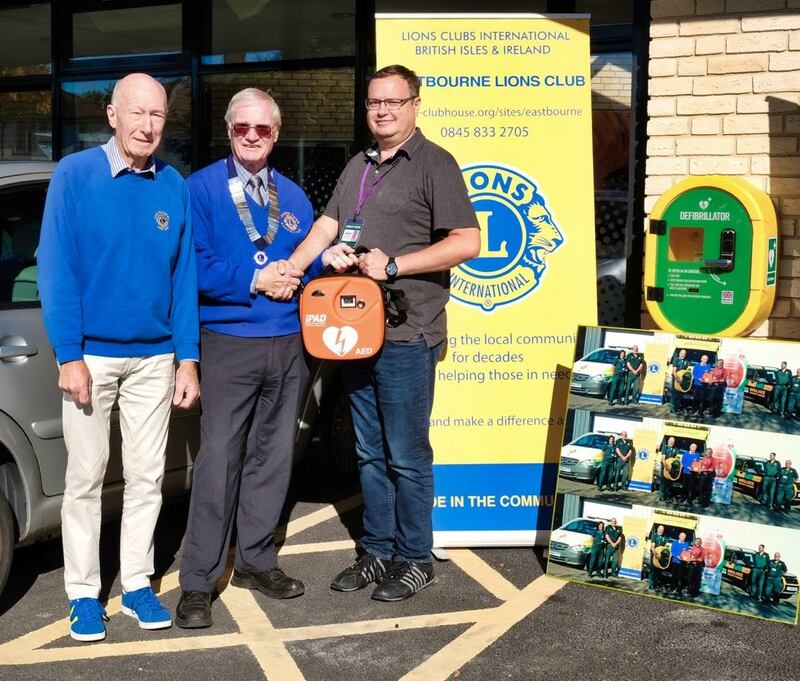 Driving the “Save a Life” campaign Eastbourne Lions Club spokesman said “Any business or organisation can buy a Defibrillator at any time they don’t have to wait until somebody has a heart attack”. This year we helped with the collection at Tesco Superstore in aid of the Marie Curie Cancer Care daffodil appeal. 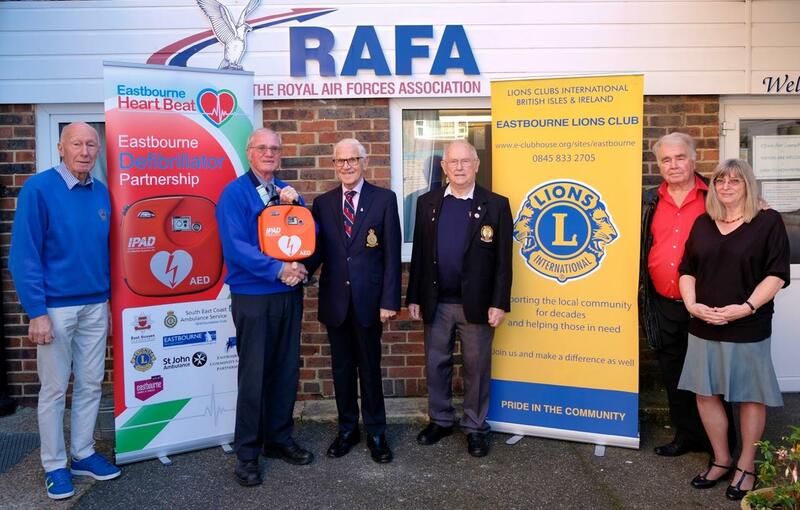 Following a talk by Professor Douglas Chamberlain at a recent Club Meeting we agreed to join the Save a Life Campaign and work with interested parties to identify the need for futher defibrillators within the Eastbourne area. 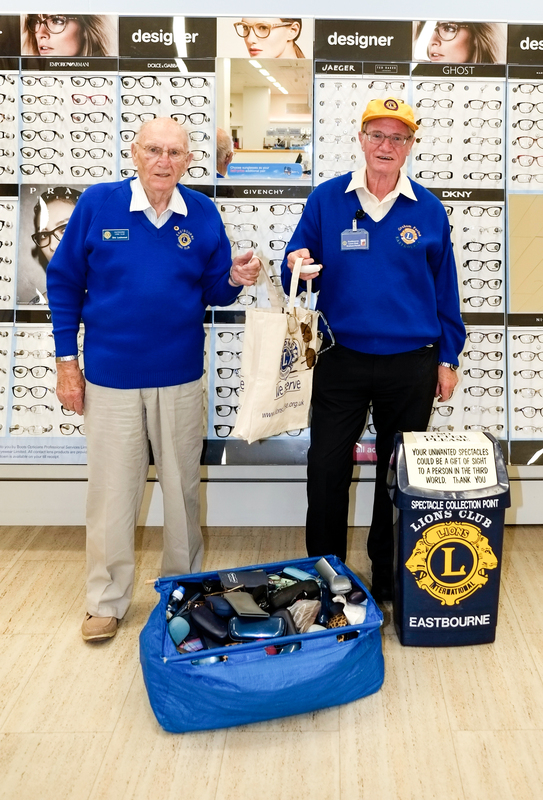 We actively collect used spectacles which we send to our colleagues at Chichester Lions Club who co-ordinate the national scheme. They are then sorted by a team of Lions in a small workshop at their Apuldram Centre. Sorted spectacles are graded by Medico France in Le Havres. 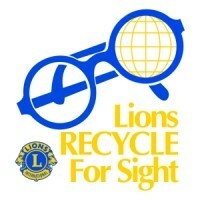 Inside Out Trust in the UK also grade spectacles in two UK prisons using equipment provided by Chichester Lions. Graded spectacles are supplied to order to developing countries for use in clinics and eye hospitals. We have a spectacle bin in most of the opticians in Eastbourne where you can deposit your old specs. Used hearing aids can also be deposited at these collection points. 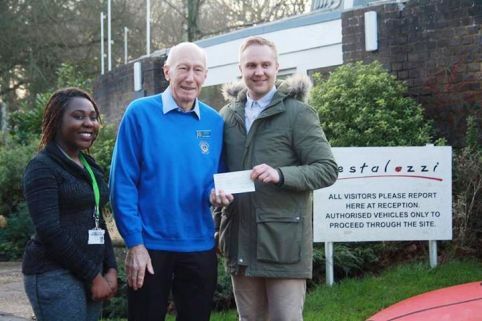 We have presented a second cheque for £1000.00 to the Blood Runners, which is a UK registered charity that provides night time transportation of blood, blood products and other urgent medical items for NHS Hospitals across Sussex. The service is provided free of charge to the NHS from 19.00hrs to 06.00hrs, 365 days of the year via a committed team of volunteer riders and drivers often using their own vehicles. Our total donation of £2,000.00 will sponsor a local motorcycle for a year. 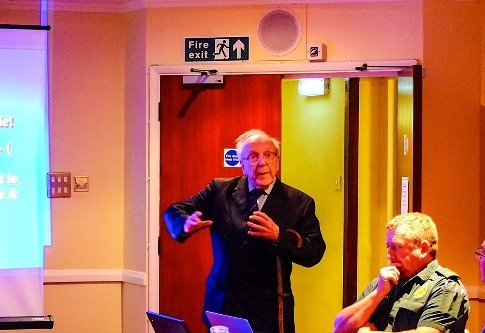 The President and members of the Lions Club of Eastbourne attended the St Thomas A Becket Catholic Junior School to oversee the local heat of the District 105SE Lions Poster of Peace Contest for children between 8 and 10 years old. The Deputy Mayor of Eastbourne and the Lion President had the job of choosing the winning painting from over a 60 entries. This was an exceptionally difficult task as the standard of the paintings was very high for children of their ages. The winning poster (centre) on the theme "The Future of Peace" was submitted by Orlaith CLICK HERE for more photos of prior years.